Rivian advisor Jim Womack, left, talks with founder and CEO RJ Scaringe on Tuesday, Nov. 26, 2018, at the LA Auto Show. Shook is on Rivian’s board of directors. A few years ago Rivian’s founder and CEO RJ Scaringe made a prototype of a small truck with a conventional, gas-powered engine. “It was an awesome prototype. We all loved it. And RJ said, this isn’t the right product,” Shook said. "We don't need to go work for anyone. But I work for RJ because he has his dream, the passion around it, and the intellect." Scaringe had already pivoted once before. He started Rivian in 2009 looking to make an eco sports car, something that could get 80 to 90 miles per gallon of gas. It wasn’t electric. Shook said Scaringe's willingness to walk away from that truck prototype—and toward the brave new world of electric, autonomous, and connected vehicles—was a big moment. “That was not an easy thing to do. I wouldn’t have done that. I wouldn’t have had the guts to set that aside, after we’d put all that into it. It was a wonderful little product, but it wasn’t what the world was going to need in 2020,” said Shook said. That wasn't the last pivot point, but for each one Scaringe has been guided by veterans of the auto industry who said they were attracted by his intellect, passion, and humility. GLT spoke with Shook and another Scaringe advisor, Jim Womack, on the sidelines of the LA Auto Show this week. They were in the crowd as Rivian's electric SUV and pickup were revealed Tuesday. Rivian now has 600 employees across the country. Most are in Plymouth, Michigan, at the design and engineering hub. Others are doing self-driving and battery work in California. Around 65 are in Normal, where the vehicles will be built starting in 2020. Shook said Scaringe has a way of getting people to want to work for him. “Jim and I and others are old folks. We don’t need to go work for anyone. But I work for RJ because he has his dream, the passion around it, and the intellect as well,” Shook said. Shook and Womack are both leaders of the Lean Enterprise Institute, an organization based in Cambridge, Massachusetts, dedicated to advancing lean manufacturing principles. 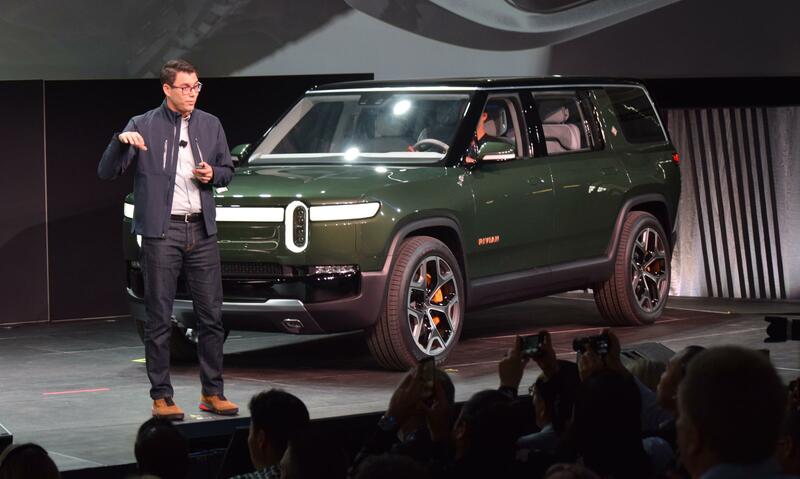 Rivian founder and CEO RJ Scaringe introduces the R1S electric SUV at the LA Auto Show. Womack met Scaringe in 2009, when the 20-something showed up to take Womack’s auto-systems seminar class in the engineering school at MIT. Scaringe was working on his Ph.D. in mechanical engineering. “He came up to me, maybe after the first class, and said, ‘I’m starting a car company. Would you like to help?’” Womack said. Womack said he knew within 5 minutes that Scaringe was legit. He's tech-savvy but also a people-person. “I’ve met a kazillion MIT students, many of whom had four-digit IQs. But they didn’t have a lot of other things you need if you’re actually gonna make something happen. And that’s OK. They can go into companies where they’re one piece of the puzzle. Whereas RJ was the whole (package),” Womack said. They've since forged an uncle-nephew relationship. Womack isn't an investor, just an advisor. He's helped Rivian navigate three or four pivot points over the last decade. There was the eco sports car. Then the little truck that was still gas-powered. Then a bigger truck that was a hybrid. But Rivian's all-electric future began to take shape in 2009. That's when Uber arrived in San Francisco, changing mobility. Google launched its self-driving car project. And Tesla's Roadster EV hit the market. And that's where Womack came in. He literally wrote the book back in 1991 about what American automakers should learn from the "lean" production principles at Toyota in Japan. When Rivian needed the big picture view, Womack was there. "I’m out talking to a lot of people, looking at the world and what’s going on out in the world. So my usefulness to RJ was not inside the company, but outside. Are we doing the right thing for where we are? Where the world is?” Womack said. The Rivian SUV sits in front of an LA Auto Show display showing off the "skateboard" base where the battery pack sits. Scaringe’s willingness to listen to auto industry veterans also struck Tom Gale, another member of Rivian's board of directors. He's in the Automotive Hall of Fame and was the architect of Chrysler’s design resurgence during the 1990s. Gale was up front Monday night when Rivian's R1T pickup rolled out from the darkness at Griffith Observatory in Los Angeles. “I love the enthusiasm. You want to get behind somebody that has a reasonable shot of doing this. Nobody in their right mind starts a new auto company in this day and age. But when you stop and think about it, we’ve been looking for white space where other people aren’t, and RJ is just an amazing character at making this happen,” Gale said. Shook was there when Normal first crossed paths with Rivian. He traveled with Scaringe to Normal to scope things out one day in 2016. By then Mitsubishi Motors had already cleared out. It looked like the plant was going to be sold off in parts. Shook had some experience doing this. He got into the auto business in 1983 through Toyota in Japan. He worked on the joint venture between Toyota and GM called New United Motor Manufacturing, or NUMMI, in California. That was a forerunner to the Diamond-Star Motors venture between Mitsubishi and Chrysler that brought that manufacturing plant to Normal in the first place. Shook said he and Scaringe started their day in Uptown Normal, looking around, looking at people's faces, to get a sense of the town. “If we move into a community, we’re gonna do it in a holistic way. We’re going to become (community) members there. We don’t want to move out. We don’t want to leave. That made it a big decision, more than the dollars that it cost,” Shook said. Shook says Scaringe was impressed with the 2.5 million-square-foot plant right away. He tried to stop Scaringe from getting his hopes up, but that didn’t last long. “By the end of the day, we both knew Rivian needs this. And we had a sense without arrogance that the plant needed Rivian too. It was a shame to see what was about to happen. They couldn’t sell the factory, so they were going to auction off all the stuff. What was going to happen to that building? It was where thousands of people had worked for many years. It was their livelihood. And to me, that was a very sad thing to see happen,” Shook said. Rivian bought the plant for $16 million. Seeing the plant come back to life—being recycled—is also meaningful for Gale. He was part of Chrysler when the Diamond-Star Motors venture launched. “It’s nice to now see this come full circle in my lifetime,” Gale said. Is Rivian going to make it? Will the hundreds of manufacturing jobs come to the Normal plant as planned? Will tens of thousands of Rivians be rolling of the production line in a few years? Shook says they're upbeat. It's a launch after all. 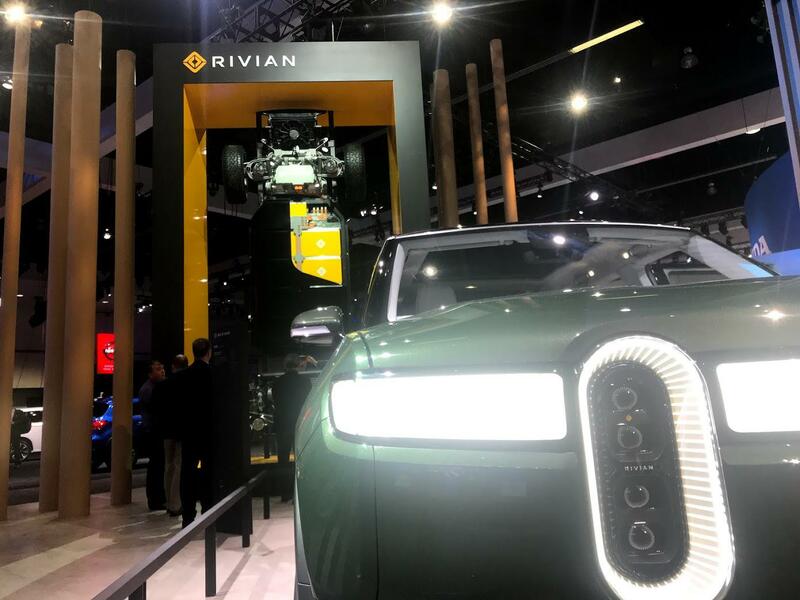 Follow GLT’s coverage from the LA Auto Show at WGLT.org/Rivian.